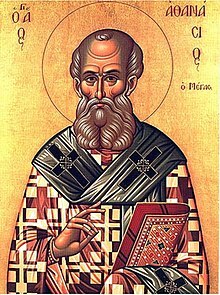 The Church Fathers, Early Church Fathers, Christian Fathers, or Fathers of the Church were ancient and influential Christian theologians and writers. There is no definitive list. The era of these scholars who set the theological and scholarly foundations of Christianity largely ended by AD 700 ( John of Damascus died in 749 AD, Byzantine Iconoclasm began in 726 AD ). ^ Peterson, John Bertram (1913). 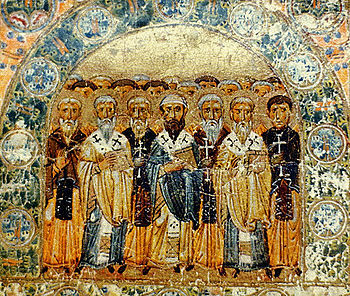 "The Apostolic Fathers". In Herbermann, Charles. Catholic Encyclopedia. New York: Robert Appleton Company. Retrieved 30 June 2016. ^ Lebreton, Jules (1910). "St. Justin Martyr". In Herbermann, Charles. Catholic Encyclopedia. 7. New York: Robert Appleton. Retrieved 2 November 2013. ^ Yohanan (Hans) Lewy (1997). "John Chrysostom". In Roth, Cecil. Encyclopaedia Judaica (CD-ROM version 1.0 ed.). Keter Publishing House. ISBN 965-07-0665-8.